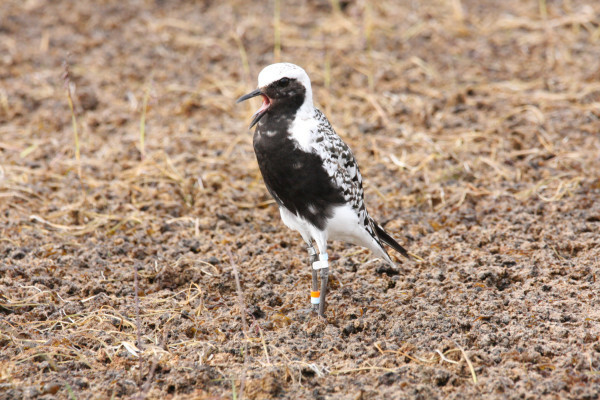 Black-bellied plover on its breeding grounds. Photo by Fletcher Smith. 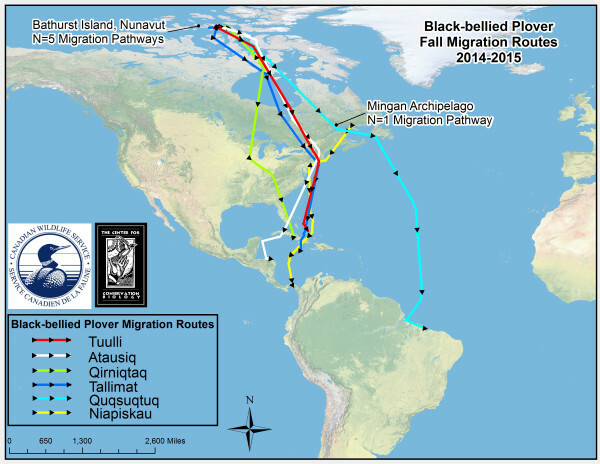 The Center for Conservation Biology, in partnership with the Canadian Wildlife Service, has tracked black-bellied plovers from their Arctic breeding locations and fall stopover locations to their wintering grounds. The plovers were trapped on the breeding grounds at Polar Bear Pass National Wildlife Area, located on Bathurst Island, Nunavut Territory, as well as at Mingan Archipeligo National Park Reserve, located in the Quebec Province along the St. Lawrence River. 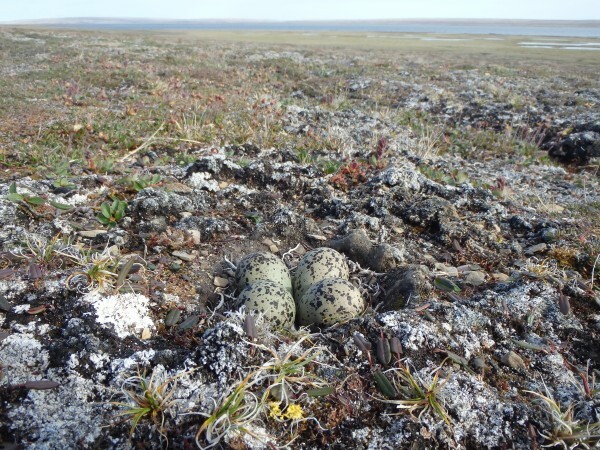 Black-bellied plover nest at Polar Bear Pass National Wildlife Area. Photo by Fletcher Smith. 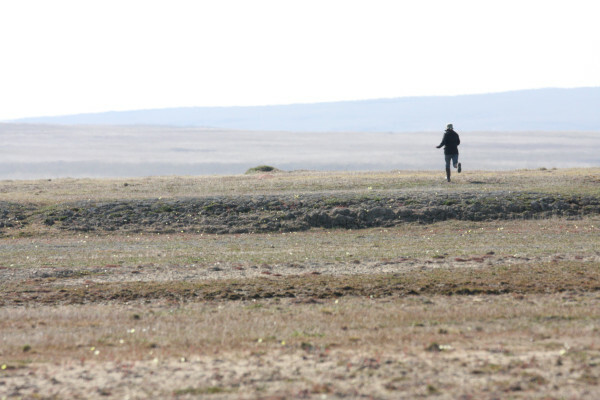 Beth MacDonald (CWS) races to a trapped plover on nesting grounds. Photo by Fletcher Smith. 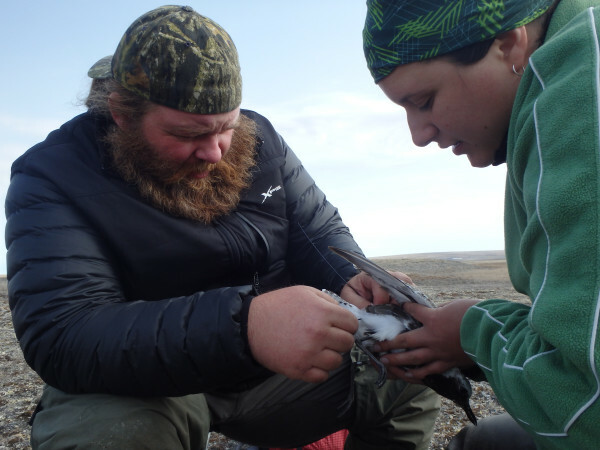 Fletcher Smith (CCB) and Julie Belliveau (CWS) deploy a satellite unit on a black-bellied plover. Photo by Beth MacDonald. 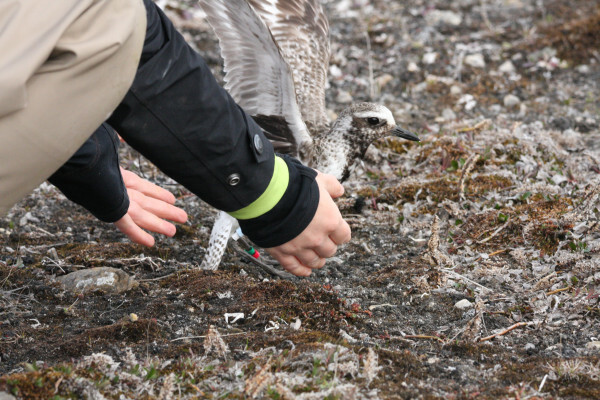 Black-bellied plover released with satellite transmitter attached. Photo by Fletcher Smith. Winter locations of black-bellied plovers tagged in 2014-2015 seasons. Data from CCB. Several interesting migration tracks were recorded, including a non-stop transoceanic flight from Newfoundland to Brazil, with the plover making the 3,462 mile (5,570km) flight in approximately five days. A long-distance land route was also recorded, with the bird flying nearly six days and 3,960 miles (6,373km) from the high arctic breeding grounds to the wintering grounds in Cuba. 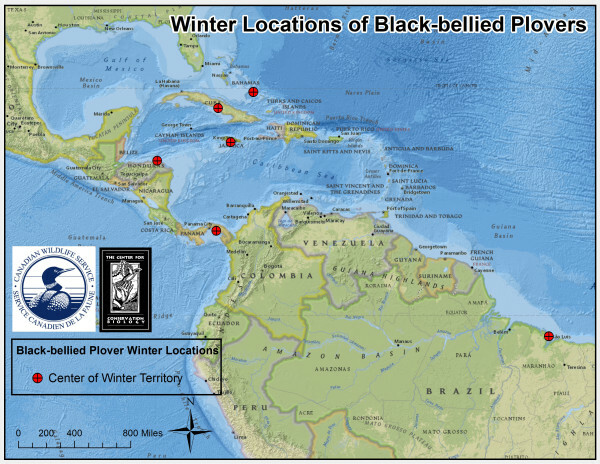 The migration route of the plover tagged on Mingan Archipeligo is interesting in that it provides evidence that at least some of the Atlantic Coast flyway shorebird populations utilize wintering grounds on the Pacific Ocean, in this case the well-documented shorebird hotspot of the Bay of Panama. Migration routes of black-bellied plovers tagged on breeding grounds and a stopover location along the St. Lawrence River. Data from CCB.